Goat hikes are back! We took a little break in September while we adjusted to back to school schedules, but now it’s time to get back on the trail and the goats couldn’t be happier. We are all looking forward to beautiful Fall weather, clear skies, cooler temps, and changing colors. Fall is always a great time on the farm and a great time for a goat hike. *Saturday, Nov 11 will be a special Veteran’s Day hike. All veterans hike for free! 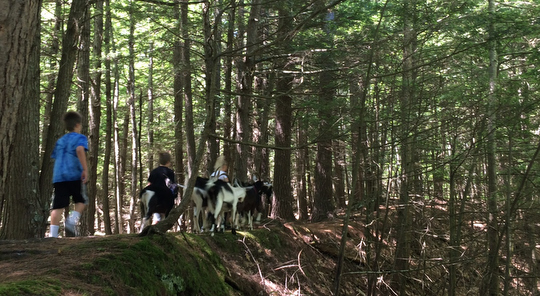 Here’s how it works: You’ll hike through the Ten Apple Farm woods with our herd of Alpine dairy goats. The hike consists of an approximately 1 1/2 mile loop through the woods on fairly well maintained trails. There is some steep terrain. Children must be at least 5 years old and accompanied by an adult. (Children under 4 must be carried). Along the way we’ll talk about goats as pack animals and you’ll learn a thing or two about raising and caring for goats. 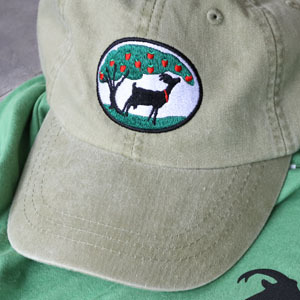 After the hike, try your hand at goat milking, and enjoy some fresh goat milk and cookies! $10 per adult, $5 for kids. To sign up, send us an email to info[at]tenapplefarm.com with your name, # in your party, and a contact phone number (cell preferred). 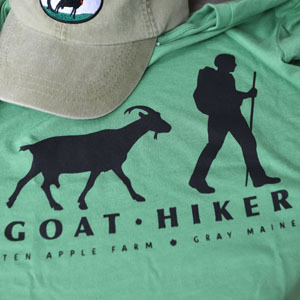 To schedule a private hike or goat themed event for your group or party, email us: RSVP today!